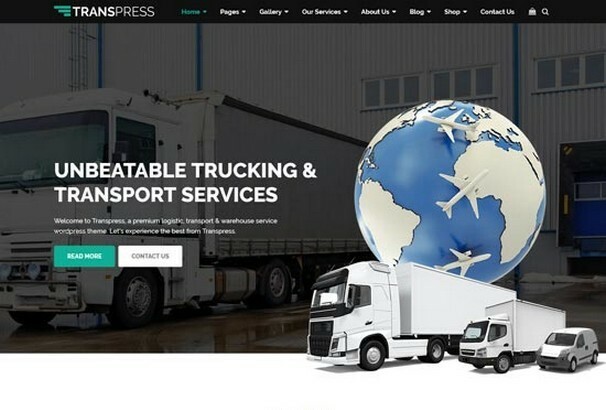 If you are in the business of logistics or transportation then having a modern, responsive and search engine friendly website will help you build your business by bringing in potential customers targeted to the services you provide. 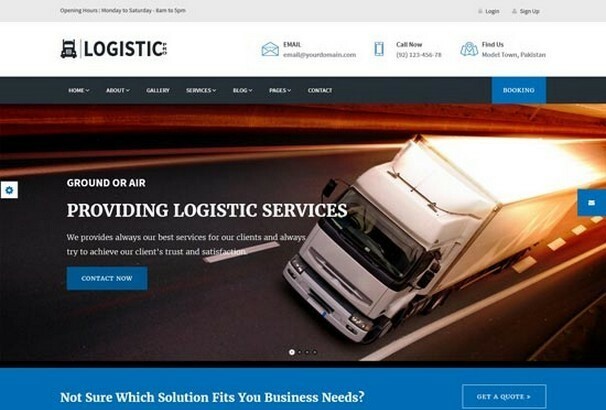 With a clear message and solid branding, coupled with a well designed website you can really make your logistics company stand out from the competitors. WordPress is a great platform to build your business website with, its easy to use, well supported by thousands of designers and developers and perfectly capable of running many different types of websites. You can extend it with the use of plugins to add just about any type of functionality you would need for this type of site – add image galleries, social media profiles, knowledge bases, live chat for your customers and so on. 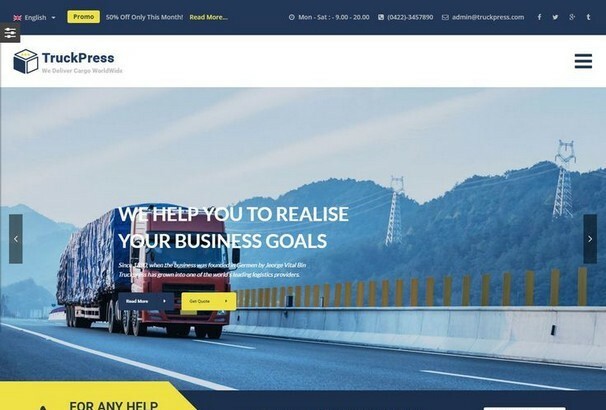 We have complied an exhaustive list of over 60 WordPress Themes for Transport and Logistics Businesses for you to take a look at. 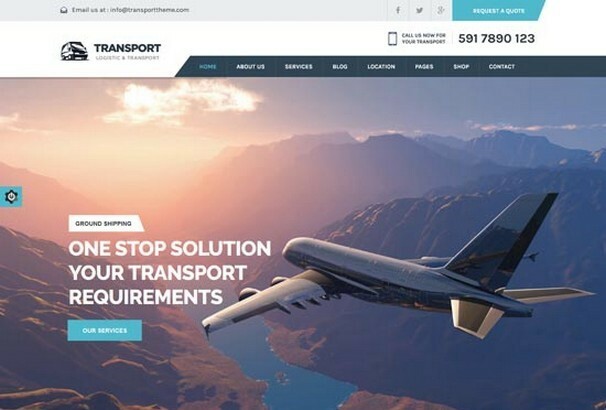 These have all been designed specifically for these types of businesses : Air Transport, Cargo Companies, Trucking Companies, Mail and Parcel Delivery, Sea and Air Freight and so on. 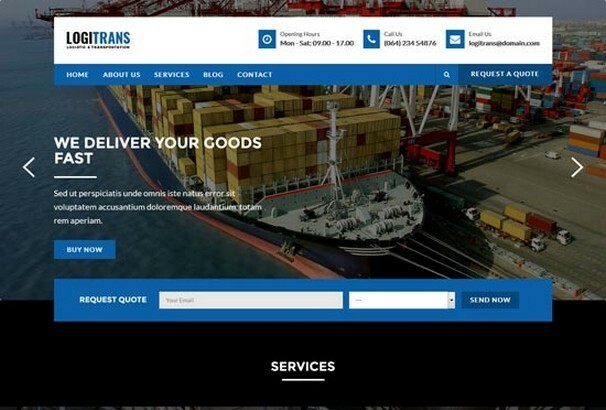 They have nice looking modern layouts with plenty of relevant imagery and space to tell your company’s story, highlight your services, provide customer testimonials, contact sections and so on. It is a great theme for the particular niche that you are looking for. It has custom post types to accommodate all your services. There are multiple colour options with fantastic sliders. The portfolio page is filterable, which adds lots of functionality. This is a multipurpose theme based on Bootstrap for the ultimate responsiveness. It is designed in a way that allows you maximum flexibility. The great customization features allow you to design the site however you want. The features presented in the theme will take care of all the things that you company might need. This is one of the most popular themes on WordPress. It has got multiple layout options with more than 25 modules, a library of presets and drag and drop functionality. The responsive theme comes with custom widgets for you to take maximum advantage of. It also scores high on Search engines, ensuring its popularity is always on the rise. This highly responsive theme has been designed to accommodate various niches as such being multipurpose. It has a built in drag and drop page builder with an awesome Mega menu. The theme is very powerful with the latest widgets and functionality and can easily adapt to any role. 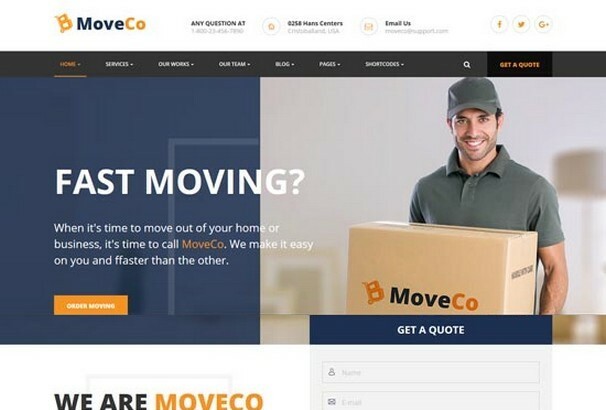 This great theme has a massive online presence. It has multiple layout options through which you can experiment with your page structure. The custom modules and widgets are some of the most eye catching elements we have seen so far. 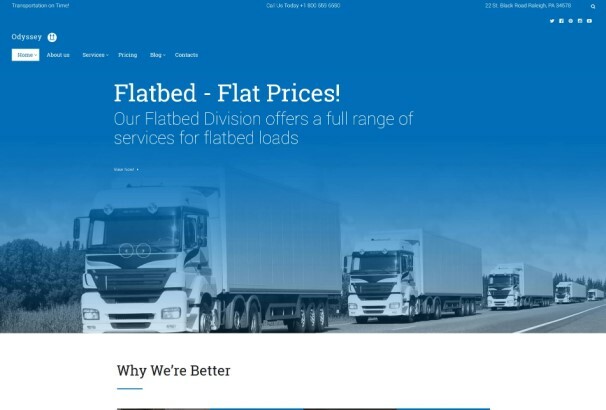 It also has a full-width header image slider to efficiently convey the vision of your company. This theme is powered by the invincible Cherry Framework 5. The theme is clean and minimalistic with a modern touch. It has a very user friendly, content oriented design which is highly flexible and customizable. Roadway is SEO friendly and optimized for maximum speed. This theme is very powerful and feature packed to the brim. The theme features a very appealing header with a full screen photo. 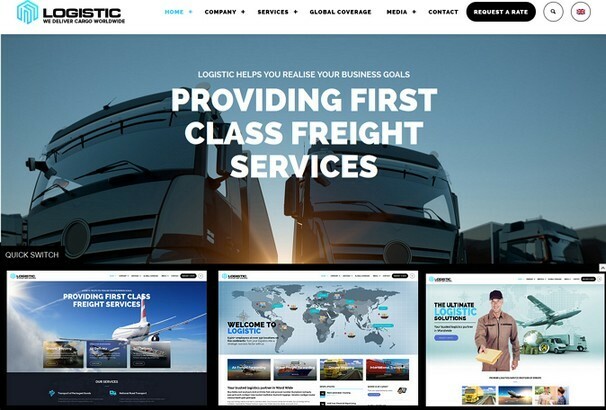 The niche optimized design with pixel perfect typography with company description, shipment details etc are perfectly placed. No technical skills are required to handle the theme, and you will also get premium tech support. 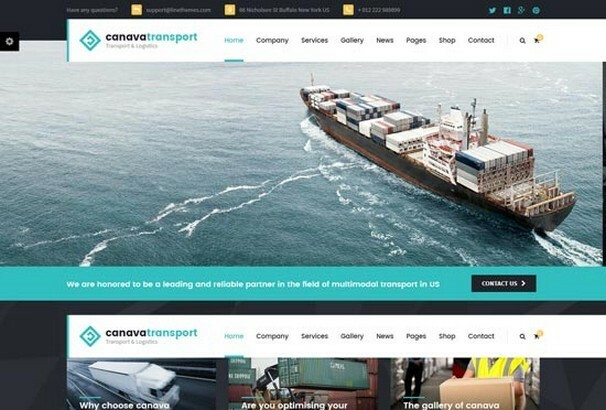 This theme has been designed to cater to logistical and transportation businesses. 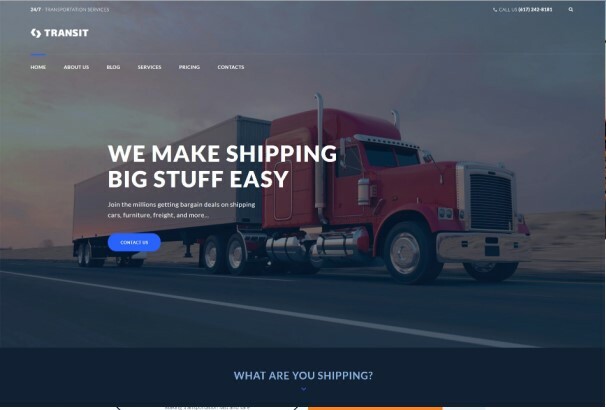 Powered by the amazing Twitter bootstrap, the theme is highly responsive with a detailed Home page layout that will fit your business of any size. The drag and drop Visual Composer makes customization as easy as it can be. You can get your site running as quick as you can satisfy yourself. 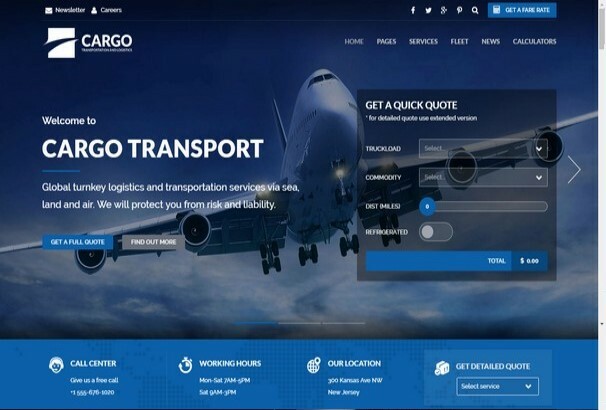 This is a great theme for your cargo and transport service business. You will get 5 Home page demos and a convenient tracking page as well. Amazing functionalities include online booking page, a very intuitive backend panel and backend shipment control. The design is very professional with great features. 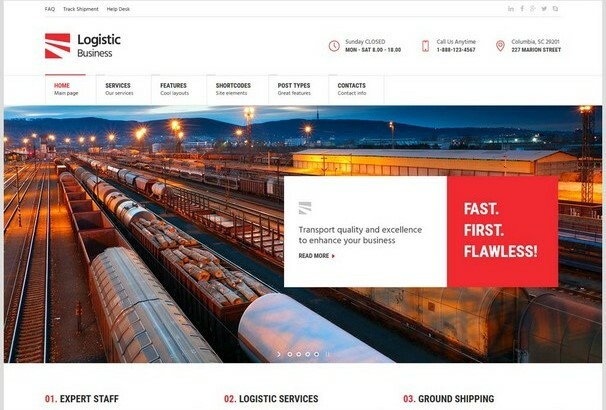 This is a multipurpose theme which is apt for logistics, warehouse and freight companies. It has all the latest web development trends with a refreshing, confident look. The design is amazing with awesome imagery for illustration purposes. There are boxed and wide page layouts, and needless to say it is highly customizable. 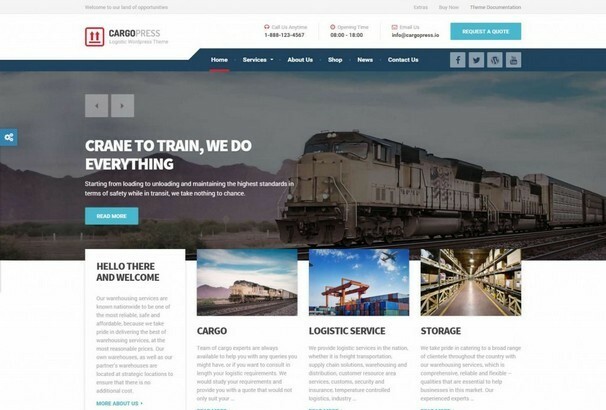 This is a fully responsive theme dedicated for the transportation and freight business. The delightful theme has great functionality and a massive presence with big bold images. Customization features are enhanced by the WordPress live customizer and Visual composer to great affect. This theme is a comprehensive and feature rich theme. The lightweight framework makes sure it is lightning fast converting to great SEO scores. The theme in itself is outstanding with a great structure ensuring flexibility. You can get the site running in less than a minute with the one click demo installation. This theme is one of the best in the business with fantastic usability and looks. It has been built with some of the best technology to make your website look nice without compromising on performance. It has a track and trace feature too, which helps immensely for your niche. This visually stunning theme has 5 Home Page variations which are all equally good. The design is clean and modern with great imagery. Features are amazing and will meet all your requirements. There are unlimited sidebars and Google analytics built in. 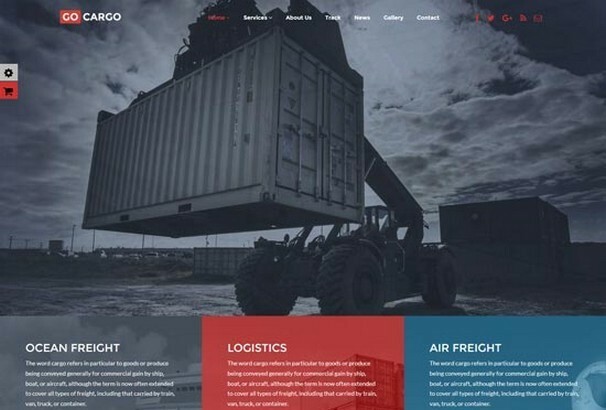 This is an amazing theme built for logistics, cargo and transportation services. It is a one stop solution for your entire web presence irrespective of the size of your operation. Customization features are abundant for your redesigning ideas. 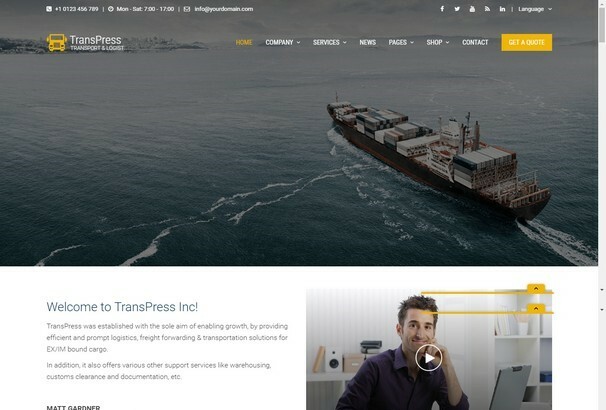 This is a multipurpose WordPress theme suitable for any kind of website or business. The theme boasts of superior performance and great customization features for multi utility purposes. You will also get 24/7 support from the developers. 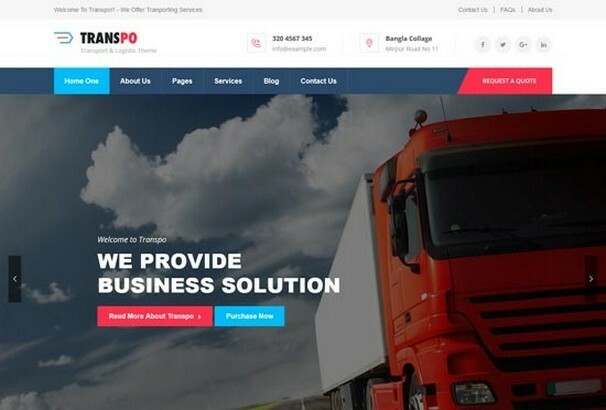 Trans Logistic is a new theme with modern designs and features. 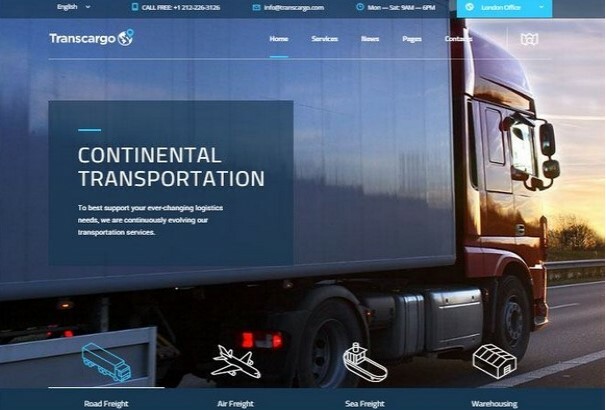 Online cargo tracking has been integrated with the theme for great functionality. The theme is buttery smooth and very fast. It also has the Revolution slider enhancing the visual appeal by a great degree. 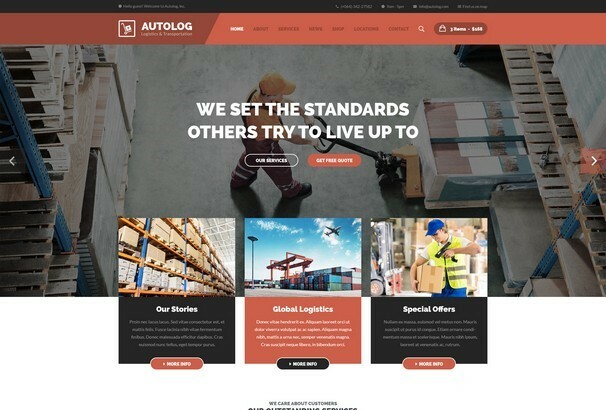 AutoLog is a highly responsive theme for a professional looking Transportation and Logistical website. It has unique home page layouts with advanced page builder options. It is also WooCommerce and Translation ready for you to dive right in. 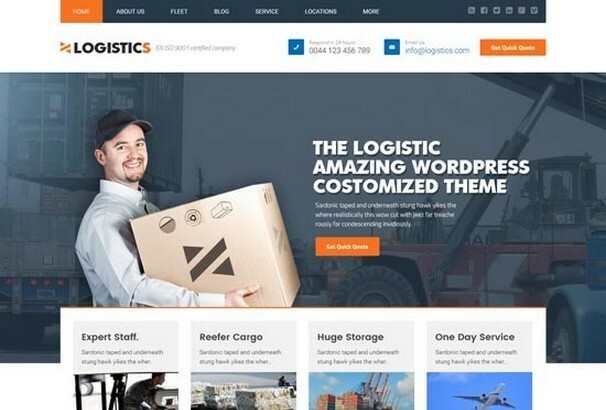 This is a WordPress logistic theme for warehouses, trucking and transportation services. This very appealing theme is high on functionality as well with a Theme page builder, contact forms and Revolution Slider. The creative design is sure to impress your clients. 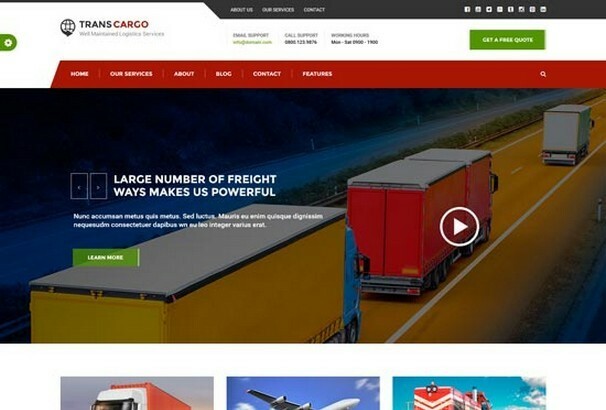 This premium responsive WordPress theme has been created especially for logistic and transportation companies. It is packed to the brim with great features like custom components, web fonts and powerful animated content. It is simple to use and result oriented. 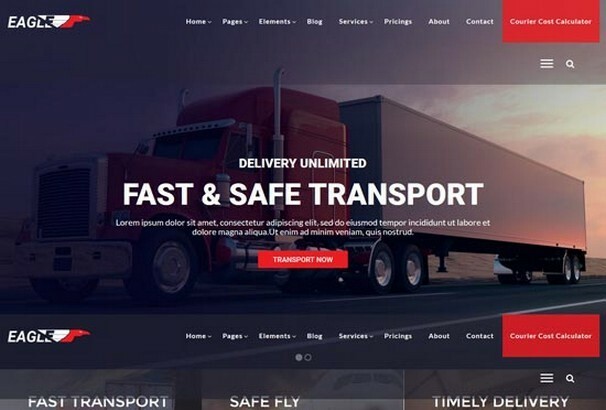 As the name suggests this theme is dedicated for delivery and logistic company. It has been built on Redux Framework for amazing functionality. The Mega Menu and Revolution Slider have great visual appeal. It is feature rich with WooCommerce functionality ready. 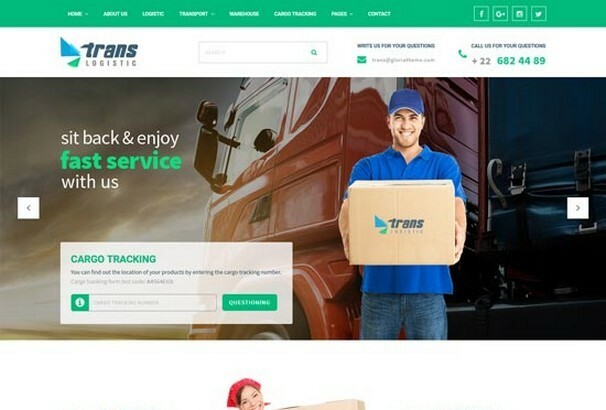 Transpress meets all the needs for a transport and logistics service website. It has great visual appeal with all elements displayed beautifully. There are more than 7 creative Homepages and great elements which reflect a professional persona to the site. 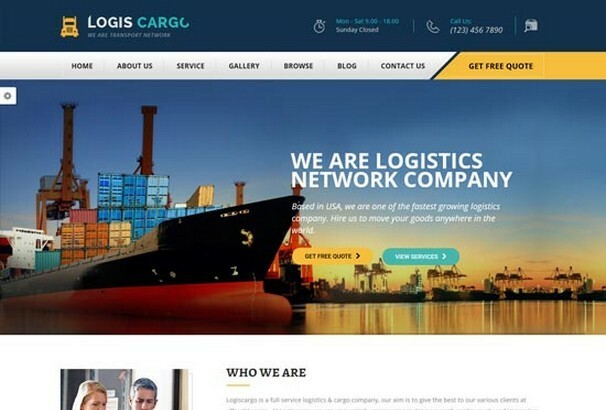 This awesome logistic and cargo theme scores huge points on its visual appeal. The stunning visuals have unlimited colour schemes along with Revolution Slider. There are also 4 Home Page variations and 2 service page variations. The functionality is at par with industry standard features. 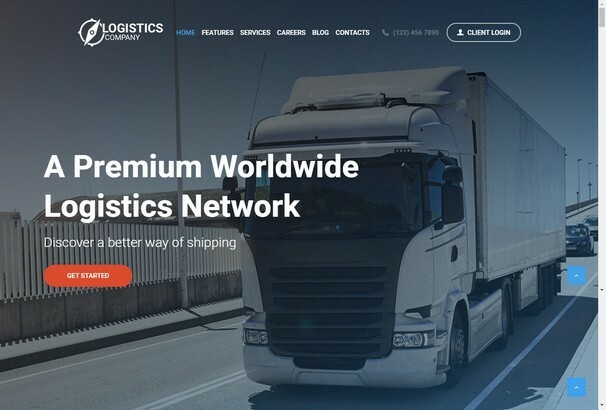 This is another premium theme for the transportation and logistics niche. The theme is intuitive, simple to use and loaded with powerful features. There is also a map option for an immense result oriented website. It provides excellent user and admin experience and along with the Revolution slider and custom animations makes the website a delight. 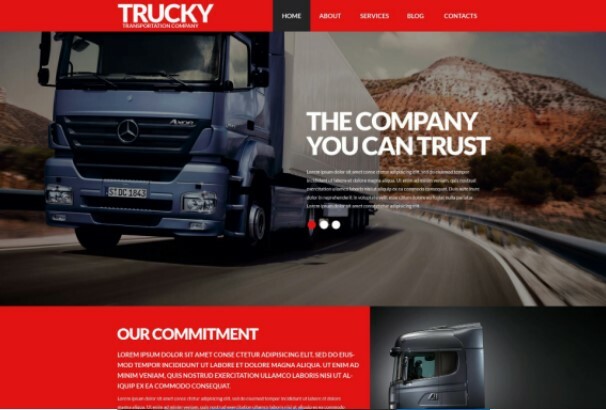 This highly responsive theme has unlimited predefined layout and colour skins. There are advanced theme options that can be easily accessed from the very powerful admin interface. The customization options allow you to build your site as you want. It is also WooCommerce compatible and has other amazing features. This is one of the best looking premium themes for the niche that you are looking for. It is highly responsive and designed to give your website an elegant look. It comes with a wide range of Home Page layouts which is easy to customize and fully featured. 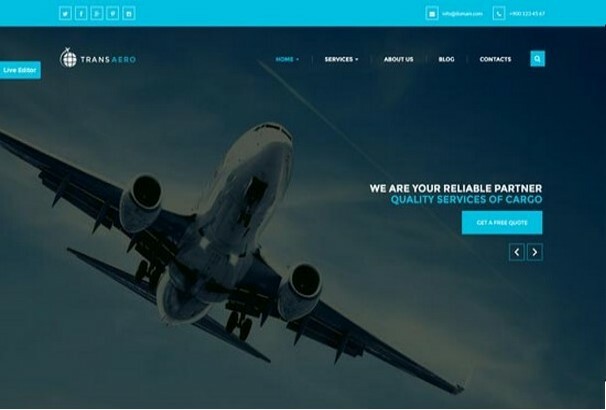 This awesome theme is built on Bootstrap for providing amazing responsiveness. It has 2 Home Page layouts and unlimited colours to choose from. The Visual composer is immensely helpful for customization purposes and the Revolution slider displays your content with stunning effects. This amazing template comes with 6 installable demos, using which you can set up your site in minutes. 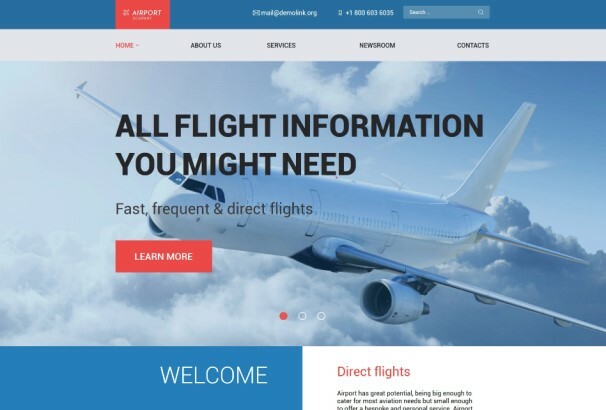 The theme is very stylish with great features packed into it. The Theme Option panel grants you the power, ease of use and flexibility to customize your site however you want. 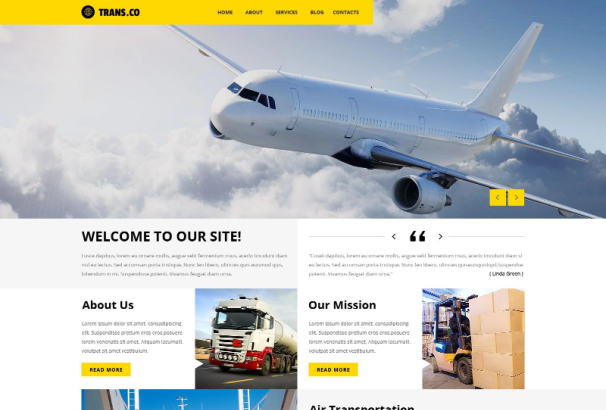 This is a great theme that has been built after extensive research on the industry. The theme is user friendly, modern looking and coded according to the latest standards to make it fast and high ranking for search engines. It has dedicated pages for projects, blogs, testimonials and team page to make your site have an immense online presence. 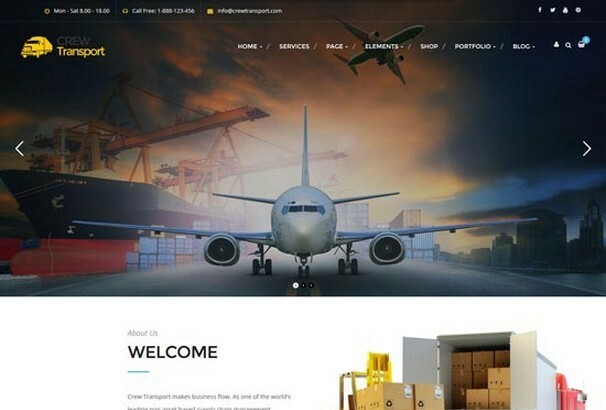 This is a stylish, modern and powerful theme with high class business design perfect for your niche. The design is eye catching with 3 Home Page layouts to choose from and a lot of beautiful sliders arranged with clean and distinct sections. It has a “Calculated Fields Form” to calculate costs and Opal Transport to help the admin to update transport services. 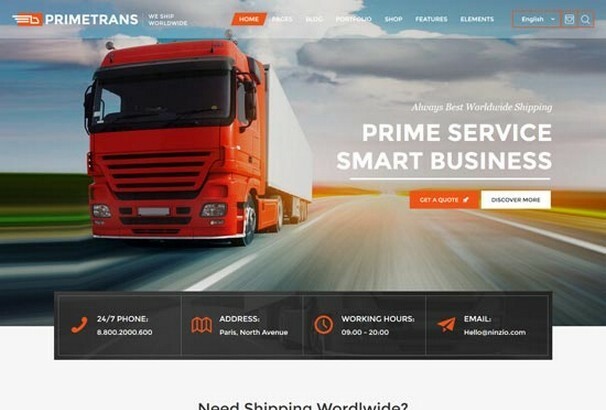 Prime Trans is an amazing theme with stunning visuals that will leave you mesmerised. It is ultra responsive and retina ready providing an extra edge visually. There are also tons of handy shortcodes making it very easy to build pages. It is also WooCommerce integrated. With this theme you can easily create a modern website and start promoting your services. The theme adheres to industry standard features and covers all necessary functions and abilities. It also has 7 predefined colour skins to make your site very attractive. 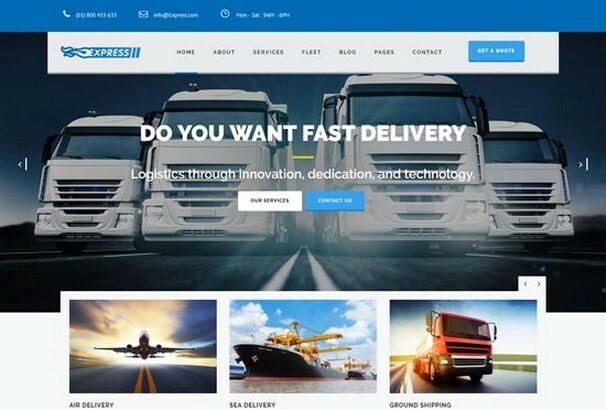 This is a great template for transportation and logistical companies. It provides a simple roadmap to create a great looking website. The intuitive page builder and real time customizer radically changes the appearance of your site. The sidebars and awesome widgets add tons of functionalities. This template has a high class business appeal. With a stylish and powerful interface it can really make your business stand out. There is a service calculator along with a quote request form. The Content Timeline Plugin displays all your content in a chronological order keeping all your site information in an organized manner. 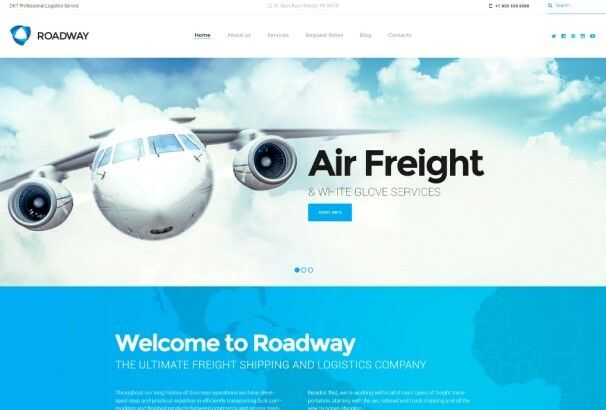 This is a clean corporate theme for your transport and cargo delivery company. It has unlimited project portfolio layouts based on a grid pattern. The theme also has an easy to use page builder and amazing page transitions and animations. 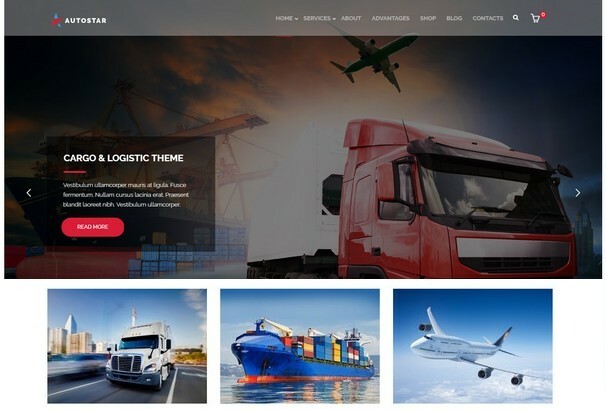 This theme has a simple, straight to the point design with unique elements specific to the transportation and logistics industry. It has all the features that you may need along with custom icons to showcase your services. There are also interactive locations Google Maps page for you to configure and your users to make the best out of the feature. 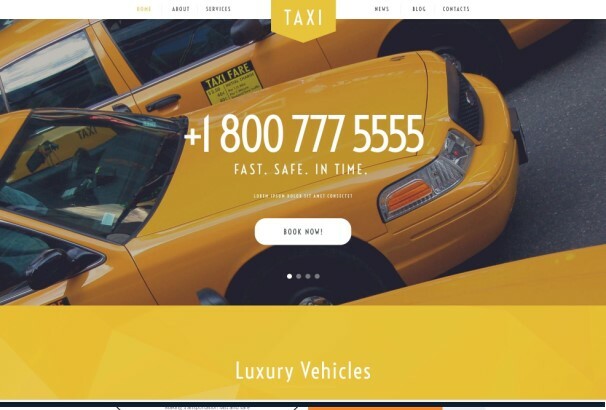 This is a modern and functional theme for your particular niche. The theme is very smooth and very stylish. WPML compatibility allows creating multilingual presentations of your business. 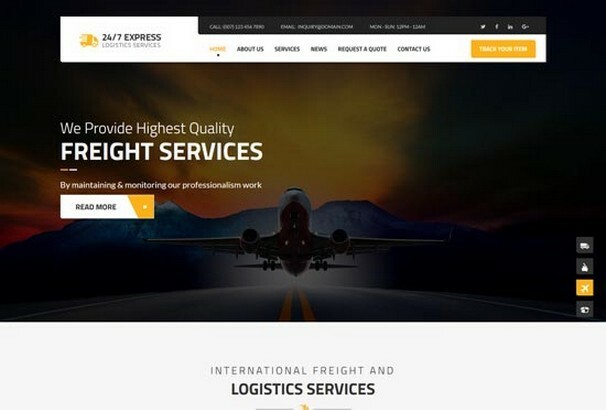 It is highly responsive with unique shortcodes for a customised and vibrant ambience on your site. 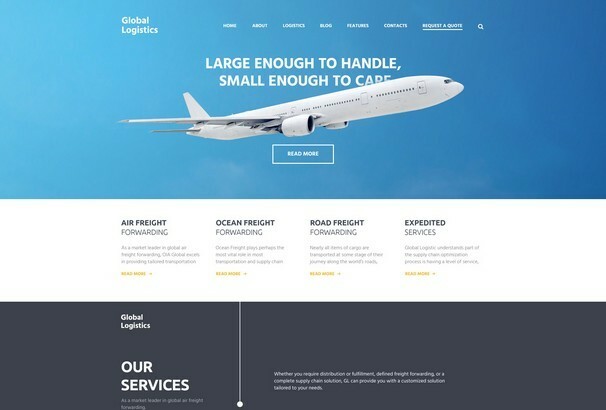 This theme has three unique Home page layouts with great imagery and stunning design. The Revolution and Swiper slider are responsive as well very functional. The theme has been coded with search engines in mind delivering high scores with ultra fast speeds. There is also WooCommerce and a shortcode builder for you to take advantage of.